In 2010 and later in 2011, Laws Stained Glass Studios installed a total of (16) faceted glass windows at Pine Creek Baptist Church in Oneida, TN. 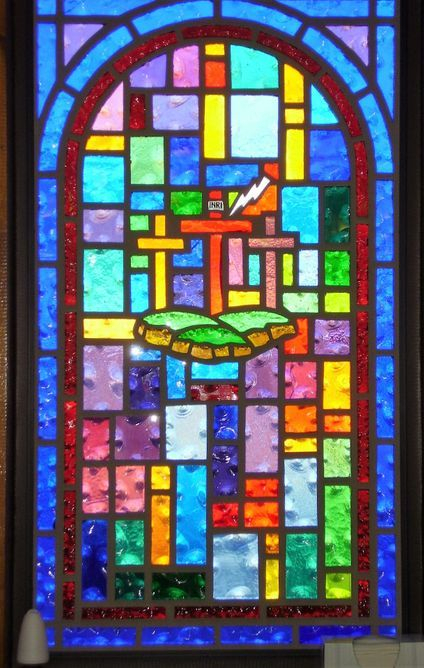 The church ordered the initial ten windows (size 36" wide x 65" high). Immediately after they were installed, the church ordered the remaining six windows of the same size. All of the windows have symbols which were chosen by the church. Laws removed the existing metal window frames and installed new dark bronze aluminum frames. The faceted glass panels were set inside the new frames.